Natural hair does not require too much maintenance – but for it to look cool – you have to use organic hair products to give it that rich & healthy look. 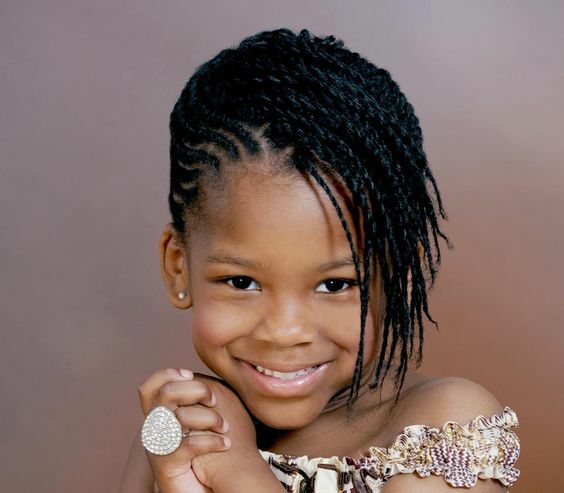 On this list, I have featured 50 Natural Hairstyles for Black Women. Some are dyed but others are 100% natural. 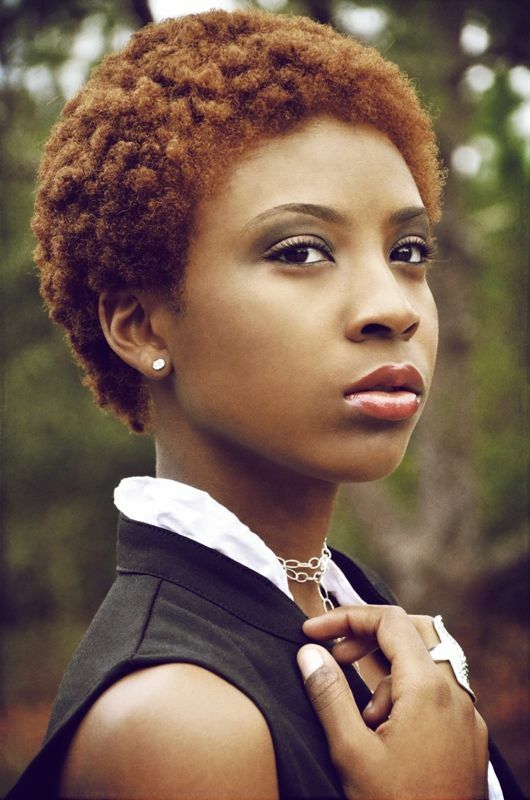 Check out these 50…yes 50 best natural hairstyle for women below and update your looks today. The timeless fishtail braids are the kind that you are pull off for about any occasion like the red carpet, runways, weddings, school and so many more especially if you have really long hair. It comes with an sophisticated look and yet can easily be pulled off in the rush mornings. It is also called the herringbone or fish bone hairstyle and in this image above, it has been placed to one side. It has drawn all the attention to her features from the facial ones coming downwards to the burst. 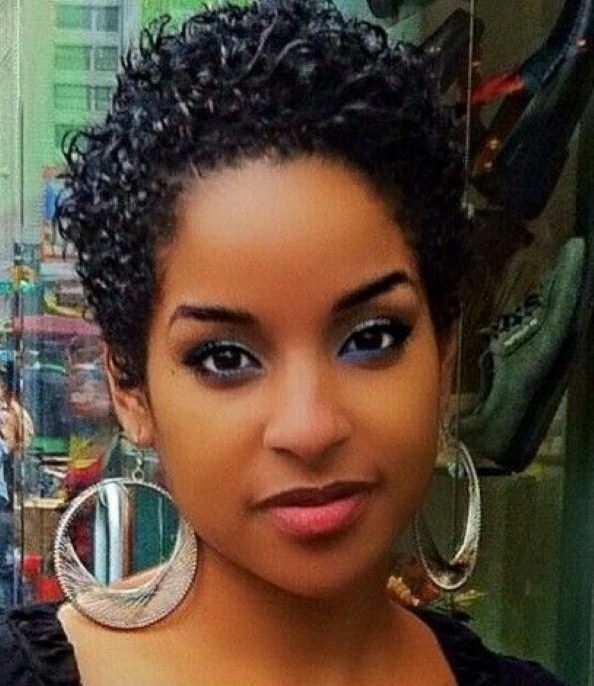 If you have a heart shape and you want the best hairstyle for all your facial features then we have chosen for you this short natural hairstyle. 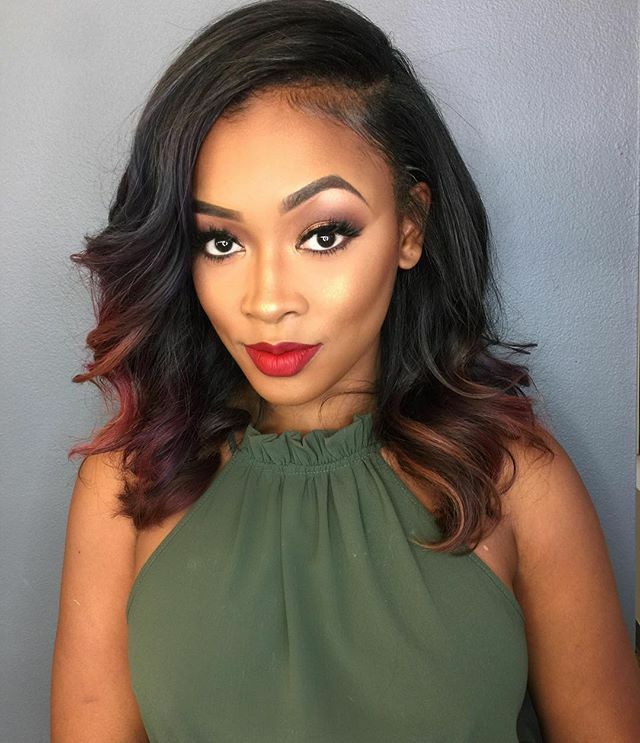 This hairstyle is short but it is full on the head and it is off the same length from the front to the pack and the sides. This suits the heart shape faces in a way that the fullness at the top will make the shape of the face look oval other than heart shaped and at the same time showing off all the amazing features without too much attention on only one part alone. 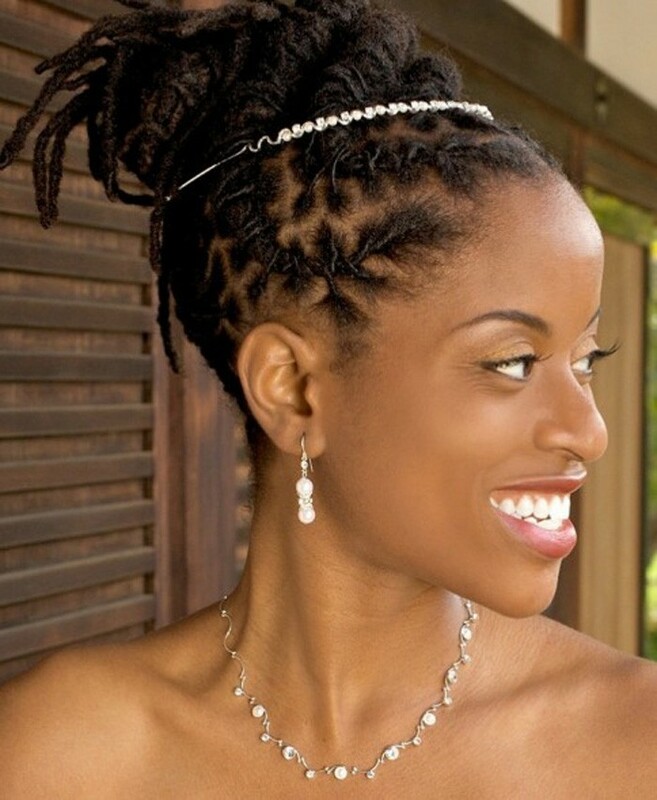 Be the bride gets to set the trend or inspire other brides to be with an awesome natural hairstyle like the one pictured. 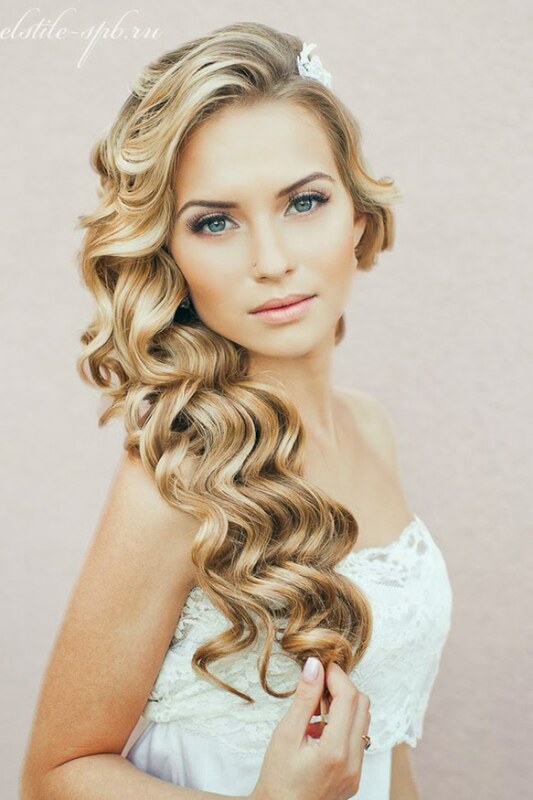 With such a side big curly look that flows over one side of the shoulder, am sure your groom won’t take his eyes off you as you walk down the aisle and take the vows. 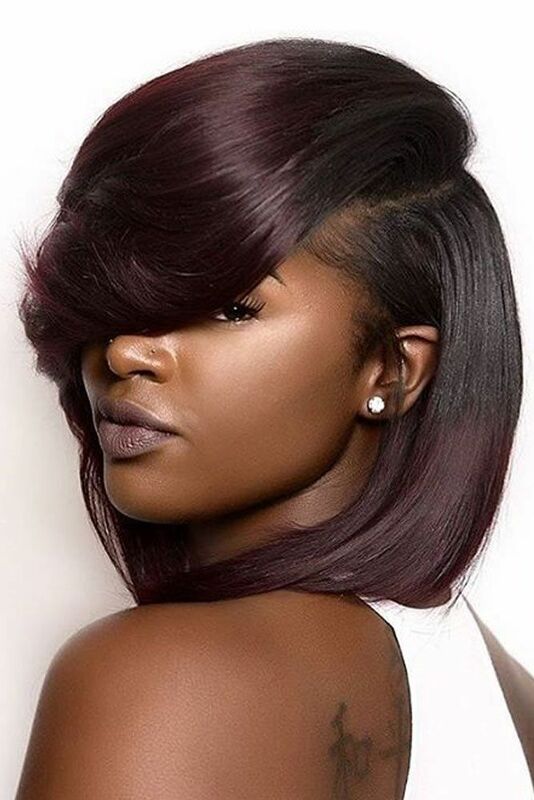 The beauty about this hairstyle is that it won’t over crowd you at all but rather leave ample room for all your features to be seen drawing attention especially from the eyes down to the neck and shoulders. She decide to add on some beautiful floral detail at the back of the hair to secure it properly to one side. The amount of freedom is such a short natural hairstyle can never be comprehended. 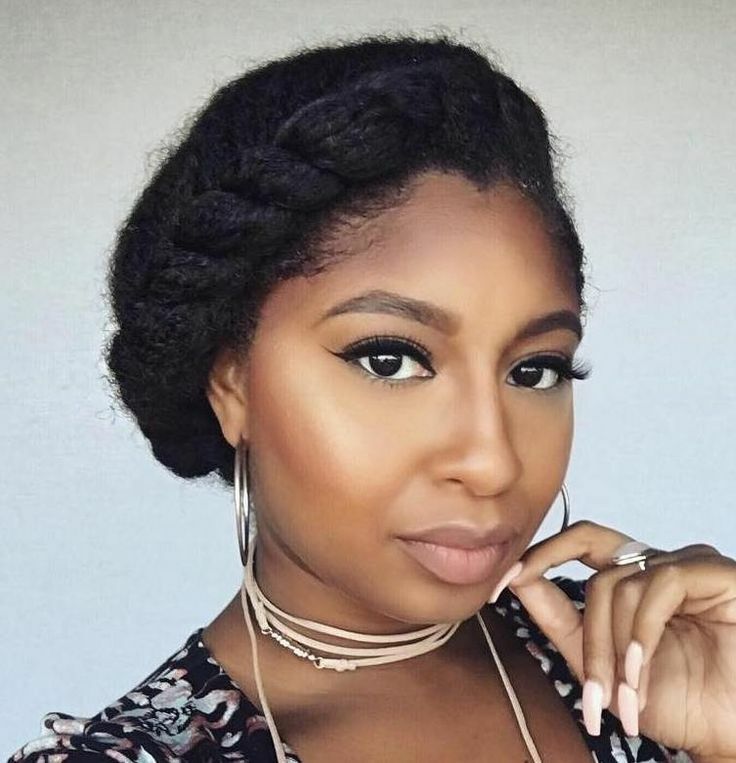 It’s one of those natural hairstyles to pull off especially in the summer seasons when the temperatures are extremely high and long hair can be so irritating. 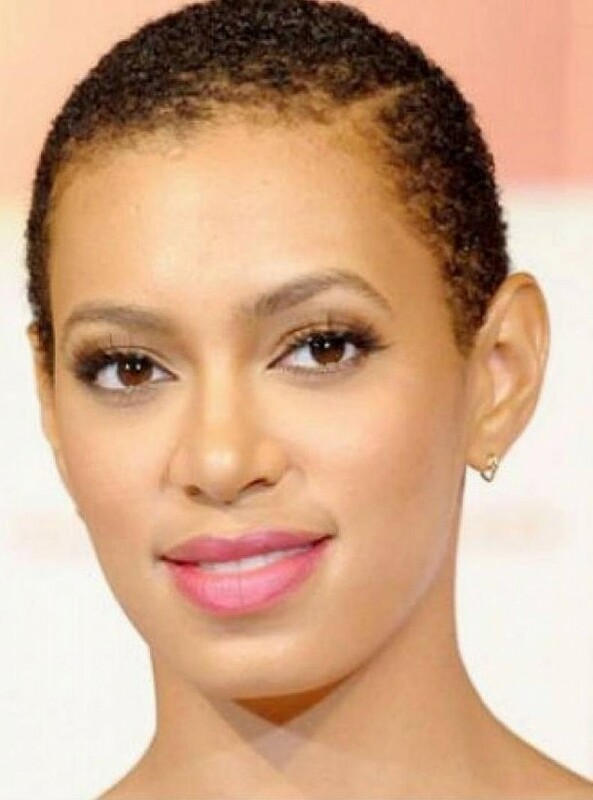 Solange looks amazing with her short naturally curly hair and she made it even more unique by drawing a line to one side of the hair. Such a line can be pulled off by your barber as he uses his machine or you can also do it yourself at home but have to make sure it is straight enough. 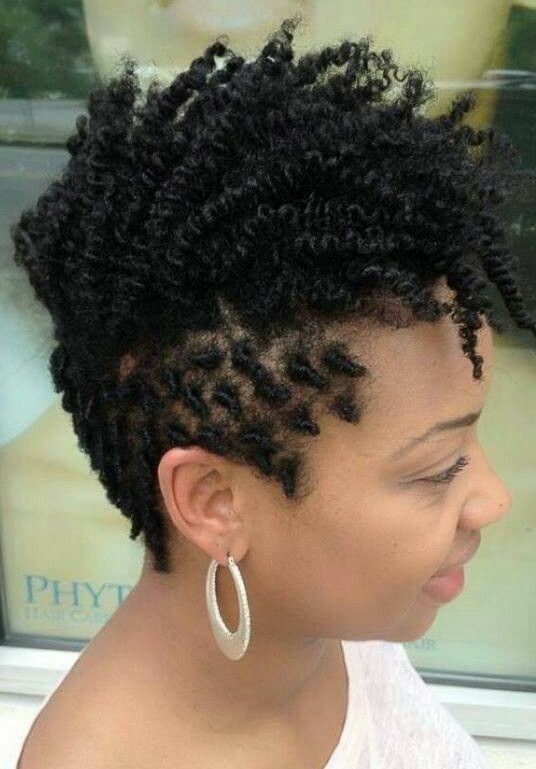 Let people be awed by your beauty using this kind of natural hairstyle for women. The beauty about up-dos is that they will leave your body completely free from hair…as in even on a windy day you will be just fine. This lady’s up-do might look complicated but it’s probably very easy to pull off for any occasion. If you have a long hair then just pull back all the hair into a pony just leaving out a small section at the front. Secure the rest of the hair into a big bun and then use a pin to secure it. As for the small portion left at the front, make sure to curl it a little before you secure it to the neatly combed hair but in a slightly messy way. 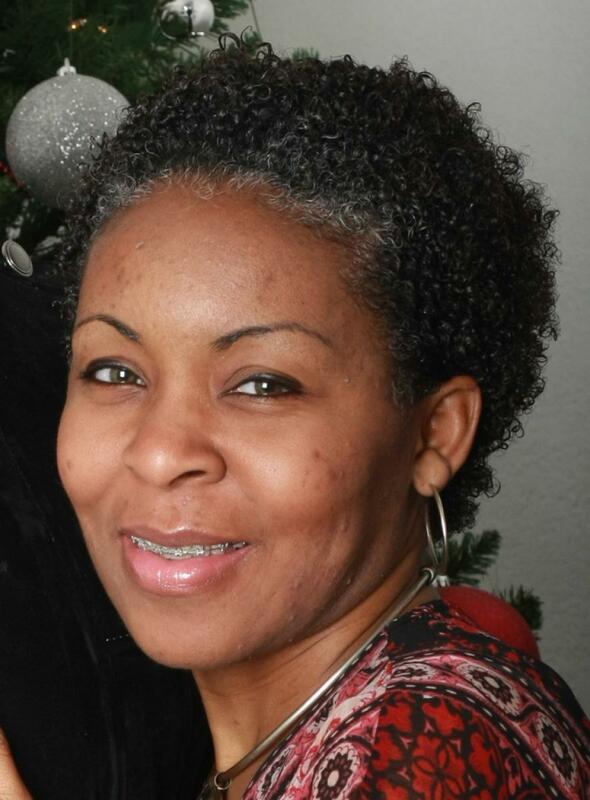 If you are a woman over the age of 50 then the best natural hairstyles for you are usually the short ones like the one pictured above especially if you are lucky enough to still be having a full head of hair. This hairstyle is almost effortless and it won’t give you a lot of stress of hair being on your body and making you so uncomfortable. It’s a mixture of black and grey hair and yet still looks amazingly stylish. It is naturally curly with curls all through the hair providing it with a soft look will the side bang at the front do the trick of hiding some of the wrinkles making you look younger. People with oval faces are so damn lucky…as in they get to pull off almost every single hairstyle available. However, if you want to show off your admirable facial shape then do opt for a hairstyle that is shorter like the one above. Make sure to that the hair is of the same length on both the sides and the top so as to create an equal balance with the chin area that is usually smaller in shape. The curls added to the hair will provide it with a softer look that can be worn for any occasion. Who says dreads having to be boring in only one natural color? Still not sure on which colors to do, let this image inspire you. 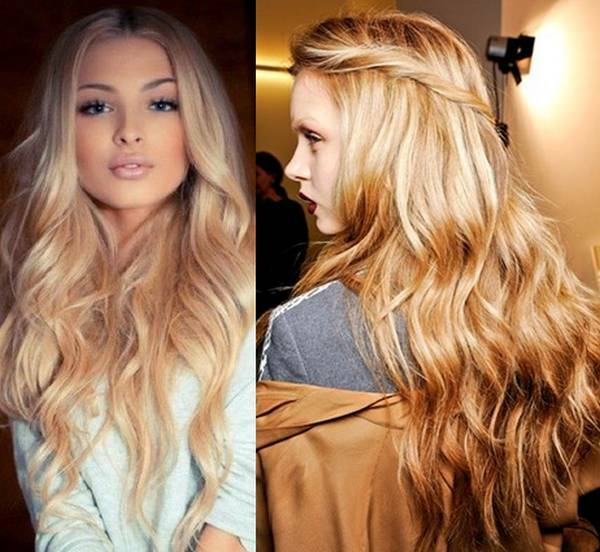 The ombre hairstyles will change a boring look to a much more fun hairstyle. 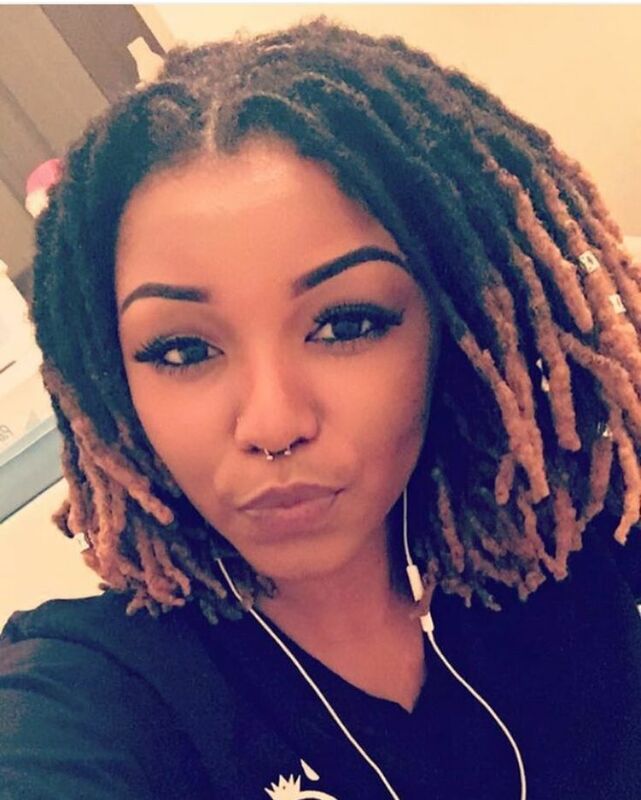 Dreads are actually styled from natural hair being locked up so when it comes to coloring, you can either first color it before you lock it up in dreads or you can color them after the lockup. This will make your dreads more stylish and different since you plan to have them on for a long time or lifetime. If you are African American or white and have very thick hair like the one pictured above then you know all the hassle that comes with maintaining it. However when you have it at a shoulder length like pictured above then it will be much simpler to manage it. This is because it won’t be too long to stress you neither will it be too short. It just perfection! It contains some easy waves in it that makes it more stylish and will make the facial features look softer. These waves also don’t make it look too plain and it can be pulled off for about every occasion. The kind of movement that is involved in bouncy hair especially when you are walking is something that can’t be compared. Talk of getting people lost I staring and admiring your hair. What amuses me most about this hairstyle is that you don’t have to cut off any length of your hair to have such a short look. 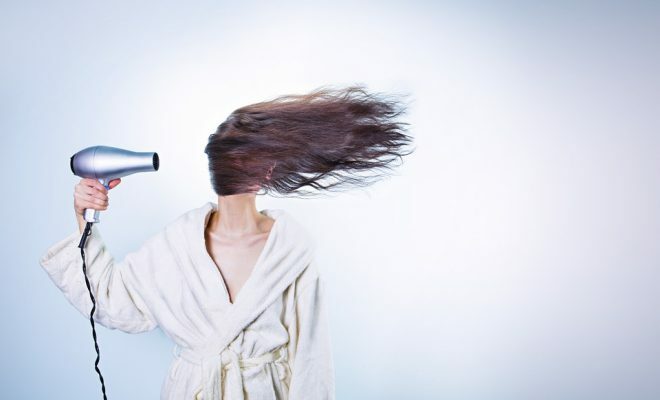 All you have to do is get your curling iron ready that is if you don’t have naturally curly and bouncy hair. Make sure you spend enough time achieving the bounce and it will take much longer. It can also be styled in any way depending on the occasion. 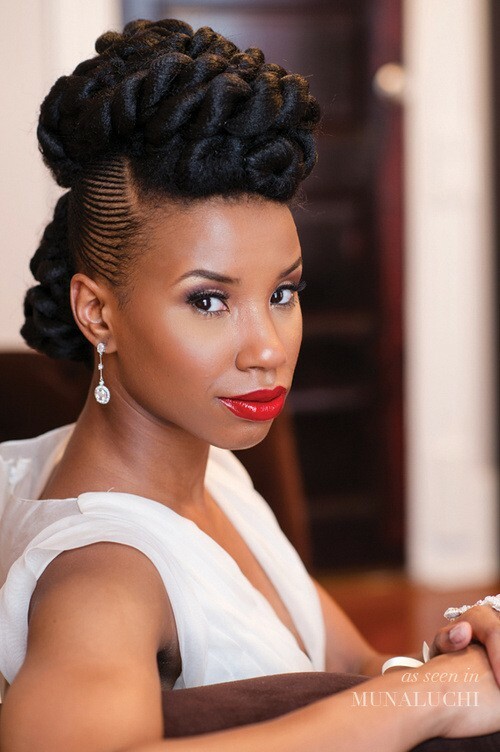 If you are an adventurous chic then look no further than this twisted hairstyle. Believe me when I say other people will want to know how you do it. Her hair is actually much shorter on the side and then it has been beautifully twisted while using a hair tool for twisting and then some oil has been applied to allow it maintain hold. On the other hand the center hair is longer and the twists have been styled in the same way. She has pushed it to the front leaving the sides exposed and creating a slight center bang style. This style would look great on all facial shapes except for the people with long facial shapes. To be a celebrity is to be a trend setter as every single person has their eyes on you! If you do it right you will be praised and girls everywhere will want to copy, if you do it wrong you will be a laughing stock. 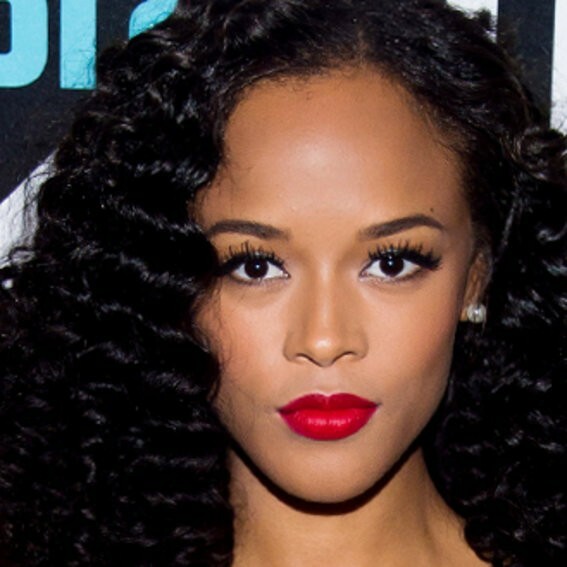 This celebrity is pulling off tightly close curls that starts from the base and then progresses beautifully all the way to the ends. 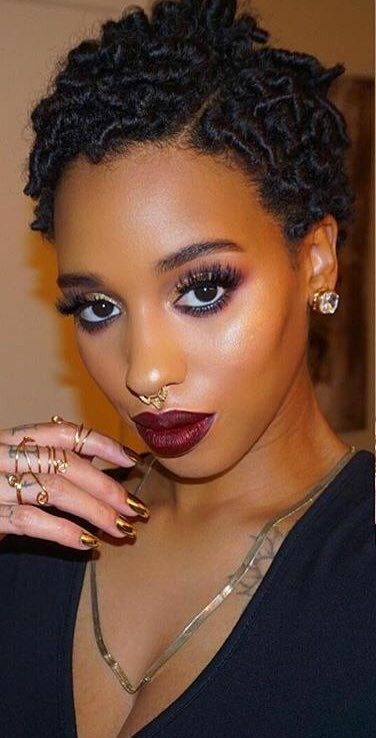 On one side the hair is tucked behind her ears exposing off her beautifully shaped facial features and of course the ear rings too while on the other it covers half the face drawing attention the bright eyes and red lipstick! One word…stunning! Looking for a way to make your bob hairstyle unique and up to date? Then color it depending on your preference or your stylist advice and do it trick. 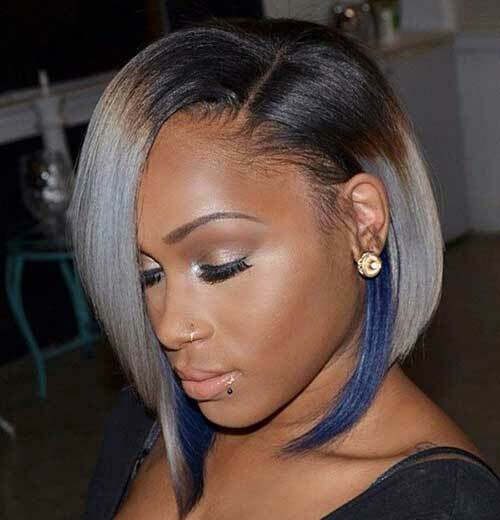 First of all this bob hairstyle is longer on one side as compared to the other and then it is beautifully colored in a combination of the natural black hair color and then chocolate brown, grey and finally blue. This is a combination not many people are bold enough to try but the results are something people will admire almost everywhere. if you want to be stylishly different then this is it. 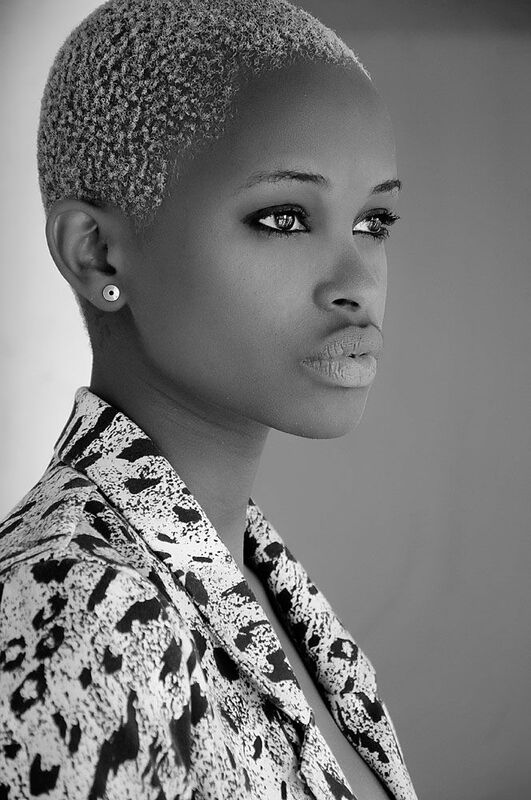 Cool pixie is the new stunning! The color of this pixie hairstyle is a combination of chocolate brown and some blonde highlights at the front to make the pixie hairstyle trendy. This hair has been combed straight up but however the waves that are found it in make them perfectly organized. When pulling off this hairstyle, make sure that the side hair is slightly shorter than the rest of the hair so that it make it even cooler. The first person who came up with the saying ‘blondes have the most fun’ definitely meant every single word. Millions of people have testified to that after. You know you don’t have to be a natural blonde to have the most fun; you can color your hair to get the look. Her blonde hairstyle perfectly matches with her skin tone and brings out her blue eyes as well. When going blonde make sure to choose a color that will perfectly suit your skin complexion. Choosing a hairstyle for your round face doesn’t have to be tricky anymore especially with a look like the one above. 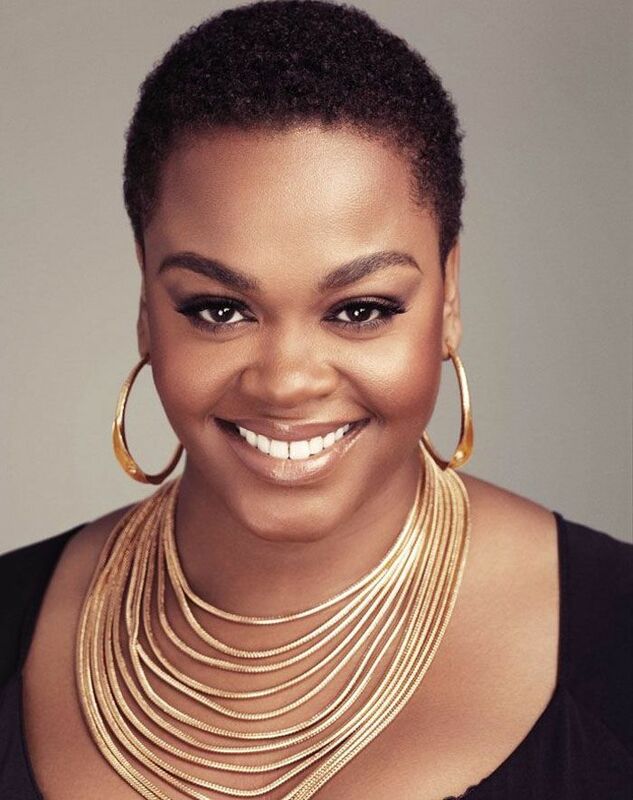 Round faces are quiet tricky because if the hair ends at the chin then you might risk having your head look like a ball but if you do the trick like this lady above then your round head shape will look oval. She has a bob hairstyle but on one side it is cut slightly lower than the chin then on the other it is slightly past the shoulder creating the impression of making the face not look rounder. 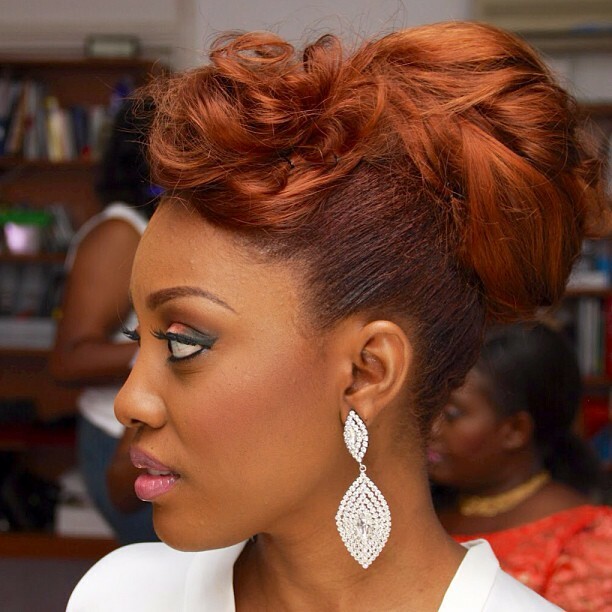 This hairstyle can be worn for most occasions including red carpet, work and even prom. It’s said a woman’s beauty is hair! Not that she isn’t without hair but because hair takes the beauty to the next level. It’s the same reason why many women I have met especially the teenagers and young adults would die to have a long hairstyle. The lady pictured has hair following down up to her waist and she has curled them simply to create a soft and fun style. On the other image a portion of hair is pulled from the front and then slightly twisted and pinned to the other side for a winning finish that can be worn to any occasion. To be trendy is to be different and yet still up on the hair game! 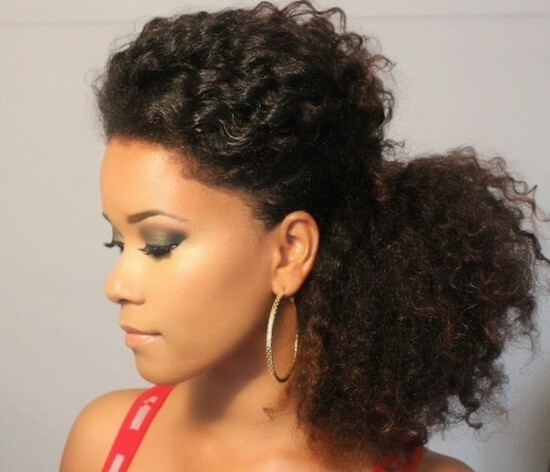 This hairstyle is actually more like a short afro-hairstyle that has been colored to brown. This brown color perfectly suits her skin complexion and makes it even brighter. This is more like a on-the go hairstyle in which if you just lightly lift up the hair used a wide teeth comb to style. Occasionally you should trim the tips or grown hair so as to maintain the length. If you have a long face then its best to stay away for long and straight hairstyles because it will only make the face look longer unless you will place on it a bang. 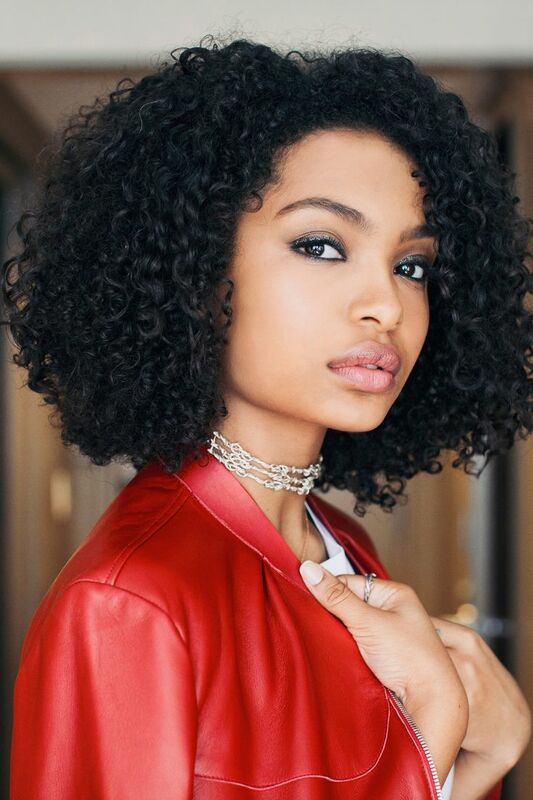 In my search I found that the hairstyles that have some curls in them especially half way through are the best for people with long facial shapes. This is because these curls half way down will provide concentration to the chin especially making it look slightly wider and creating the impression of the face being oval or heart shaped like in the image above. Prom is like the long awaited day and the pictures taken will be forever so you will have to choose the best hairstyle for that day. If no boy has noticed you in school before then this will be the time. 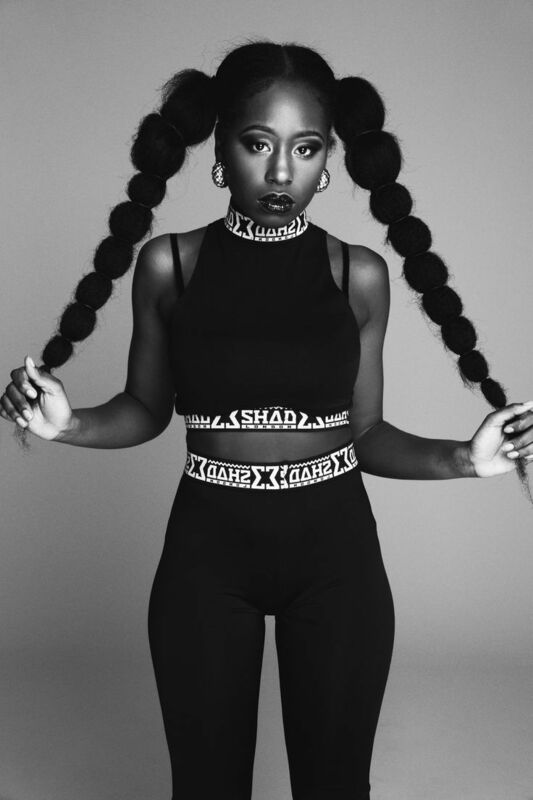 The hairstyle above is not only unique but is a combination of a twisted beautiful look and then some braids at the sides. The braids do soften this hairstyle and doesn’t make the head look bigger but just perfect. Styling this hairstyle might take a while but will be worth it at the end. There is a way accessories have the ability to change a plain hairstyle into a million dollar one especially when you place in the right accessories. 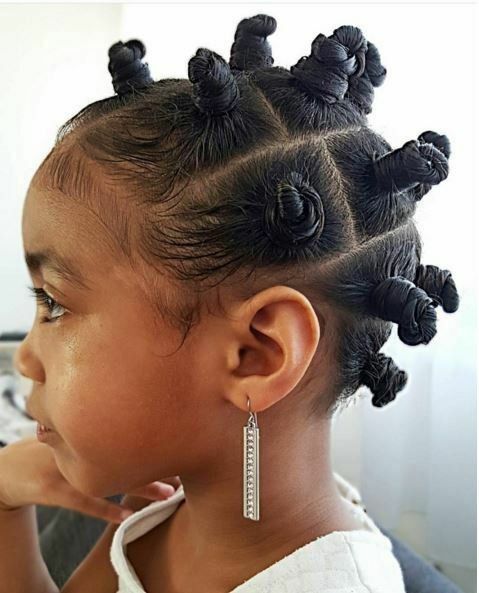 She has decided to use some very beautiful flowers or accessories on the sides and they have perfectly blended into the natural hair. This kind of accessory is perfect for an outdoor event especially weddings, garden parties and so much more. Depending on the accessory you can also wear them to prom, work and so more. One of the best ways of drawing attention to your eyes and even hiding your forehead especially if its long is through pulling off a full bang natural hairstyle. When you look at the image, the only hair that is actually down is the full bang with the rest of the hair all held up in a beautiful bun at the top. When styling this look, you have to make sure that the bang is not too long to make you uncomfortable but rather just reaching as far as the eye brows alone. This hairstyle will also make longer faces appear more appealing and it suits any occasion. 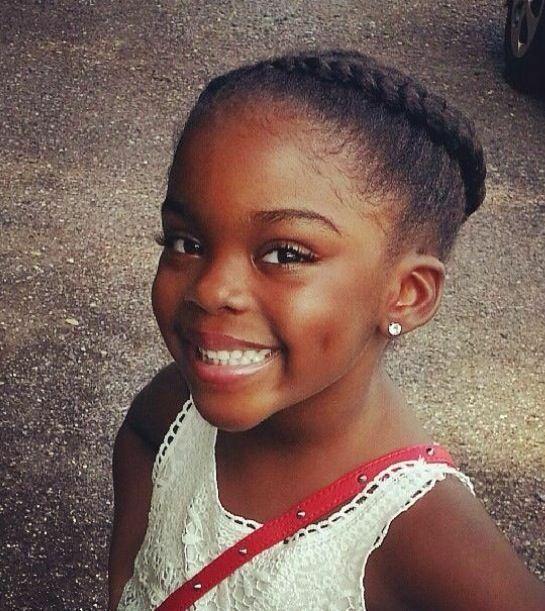 Gone are the days when people left the double bun hairstyles only for the children. Today the double bun hairstyles are on and no they are not only for the runways but even other occasions. This hairstyle makes one look younger and if you have a wider chin area then it will help balance the head well. While styling makes sure that you create an equal division so that one side of the head won’t look bigger than the other side. You can braid, twist the bun or even just fold it for a more perfect look. Thick hair might be a pain but it pulls off every look or style as compared to the other hairstyles as you won’t even need to add in any single hair extension. The curls in this hair are smaller and yet fuller from the very roots to the tips of the hair. This is very easy in a way that when you pull the hair, it will bounce back in the most charming way. Styling might take longer but style will also be durable. 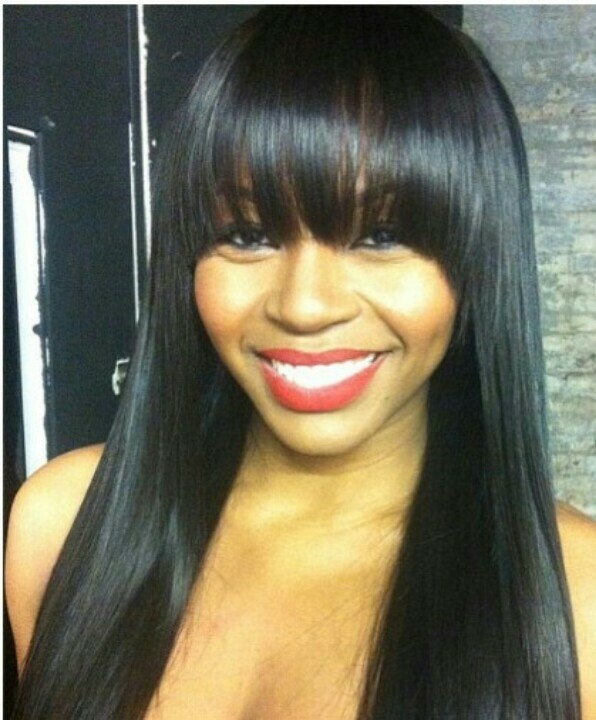 This style will make your long thick hair look shorter and make softer the facial features. 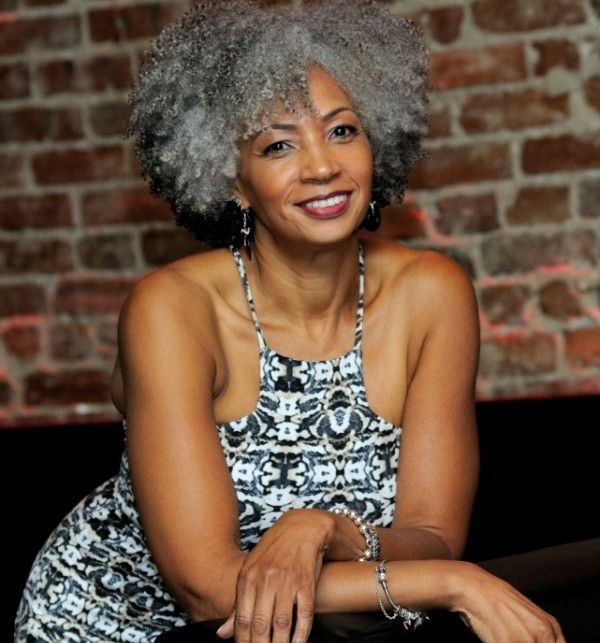 If you are a African American woman or just any African woman then there is no other way to show off your natural hair other than the timeless afro style. 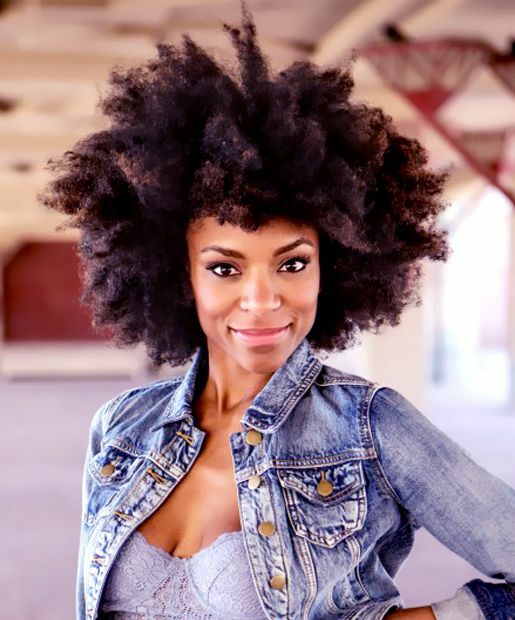 The only reason why many women relax their hairs is because of the hard texture of the afro hairstyles but if you leave it messy like the image above then you won’t have to do much like combing through perfectly. This hairstyle is the kind that makes you be always on the go. When you get up, just oil through and pass your fingers through it to comb it and you are good enough to go. if you have a wide chin then the best way to balance your facial shapes is through creating a side bang to your natural short hairstyle. This will draw attention away from the chin and rather to the bang and where it ends. If it ends at the side of the eyes then people will admire your beautiful eyes instead. Another good thing to adding a bang on a short pixies hairstyle is that it makes it more modern and different especially when you top it up with easy waves like pictured. Regardless of the season we are in or even the occasion you have to attend, you should know that wavy hairstyles will always be on style. Not only are the parts elegantly equal but the waves are very cool and fun. 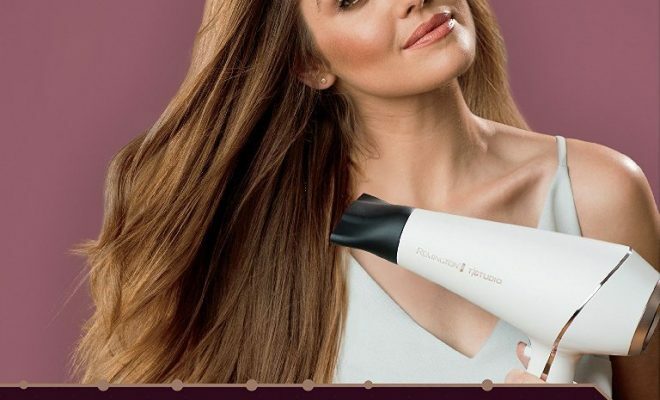 These loose waves are very easy to work with as compared to the tight ones and they can easily be pulled off even without a hot tool. 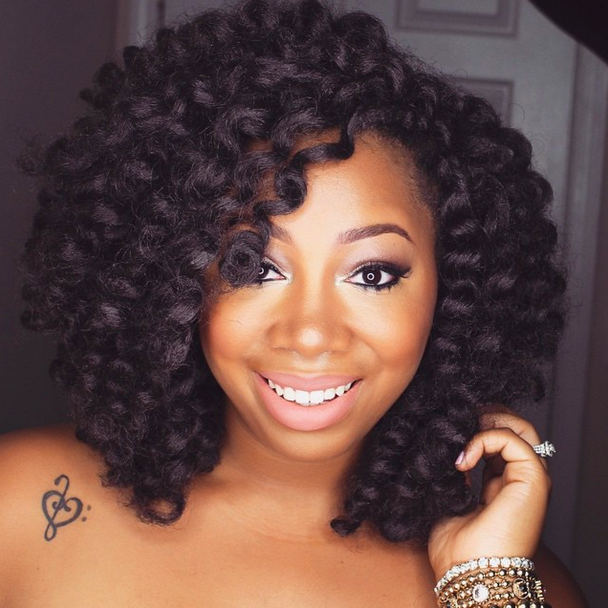 These waves have greatly perked up this natural hairstyle and her natural curves as well. Like what’s not there to love about messy ponytails!!! Voluminous…tick! Chic….tick! Fit for every occasion….tick! 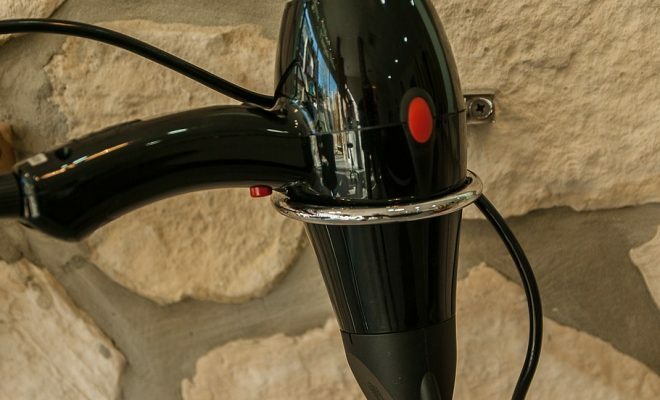 Great for bad hair days…tick! So again what’s there not to love about them! As in you don’t need the wind to help you out as you can go out looking fashionably messy with your messy ponytail hairstyle. If you have long hair then just spray it first and then loosen the top sections for height and scrunch with your fingers to make it messy. Tired of the usual plain ponytail hairstyle? Simple braid the pony! The ‘first lady’ of Scandals indeed looks awesome with her braded ponytail natural hairstyle. This is the kind of look that will have you ready in minutes and give you the freedom the rest of the day from having hair have to run on your face and even ruin your makeup like lipstick. All you have to do to style it is to gather and comb all the hair into a ponytail then place a ribbon and divide the hair into three parts and start braiding it all the way to the tips. Change your name to gorgeous with the choice of hairstyle you decide to pull off. This look is absolutely hot and yet it looks like not much has been put into styling it…actually that’s true! It one of the best ways to place some volume into your hair especially if it’s fine textured. All you have to do is create some curls in the hair them after hold a puff but make sure you push in the stick-like side of the comb in to raise the hair so its creates a big volume. Even though it’s strenuous when it comes to owning long hair, we shouldn’t forget that possessing it is very fun as you get to adventure in all these unique hairstyles. This is actually very different and an excellent choice for the summers. The best part is styling is very easy provide you have all your ribbons at hand. Make sure that you iron out the hair…even if not completely then you divide it into a sections before you secure each into a ponytail. After that secure the next few inches as well with a ribbon preferably an invisible ribbon which is the same color with your hair till the very tips. There is no more excuse to hit the gym while looking lousy or even having hair constantly falling in your face making you uncomfortable and even feel hotter in body temperature. Yeah we got you the best hairstyle to workout with. 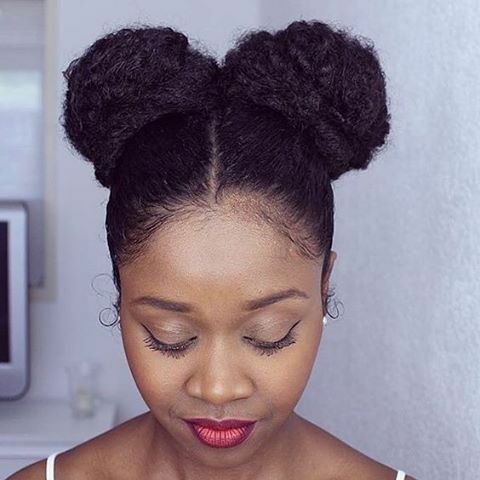 Just divide the hair on your head into two portions and then starting plaiting from the back area making your way up to the center and then twist the remaining tail of unbraided hair into a cute round bun and secure it with some pains so it won’t escape as the work-out intensifies. To be chic is to be a head turner with a fabulous hairstyle! And the best part is it doesn’t matter whether your hair is short, medium length of long…you can still pull off a chic hairstyle like the one pictured above! For her look, all she did was iron out the first section of the hair and secure it half way to the back. After that she worked out the rest into tight small curls to get the chic timeless look. As a woman you should know that when it comes to being beautiful, you good and fun for you every once in a while to throw caution to the wind and tremble your personally style. I know most women are afraid of going bold but I mean let this lady pictured or even Amber Rose inspire you. All she did was cut off all the hair to about an inch long and then went blonde….now that’s how you go bold ladies! These are some of the notes then never possibly go out of style for children. First of all it leaves them very beautiful but yet with the innocence of still being a child. It is almost effortless and yet so magical! 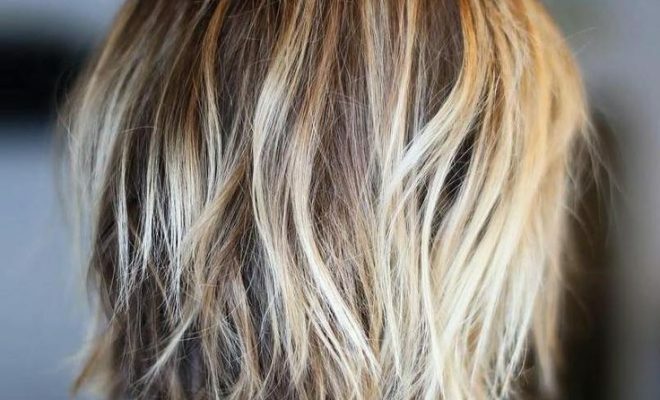 All you have to do is divide the hair into smaller organized sections that are equal and then secure them in a pony before you neatly fold them down. Your child will love you for this! one of the top loved hairstyles for women are the medium length hairstyles….I mean not so long and not too short either…just perfect! It’s like enjoying the best of both worlds. Not too long to fall on your back and not too short to remain on your head alone. 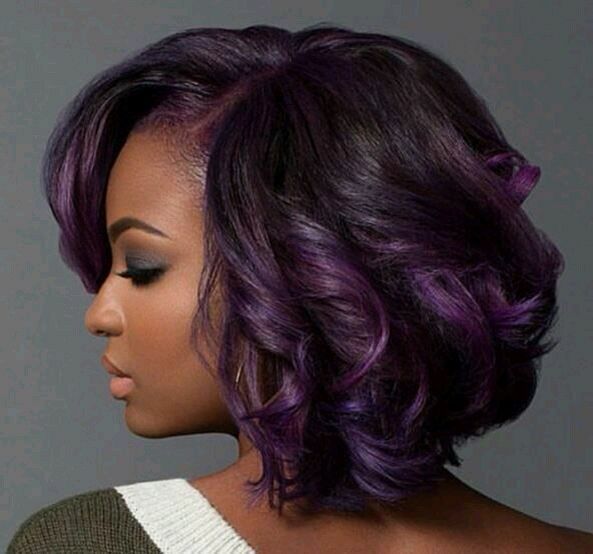 What I like about this look above is that she added in some great curls, purple color and then a side bang. Now this is how to rock a medium length hairstyle and run the show! the texture of the African American hair is definitely harder and that means you can have your hair in two ways either in the natural hard texture or you can soften it. However the good news is you very many options to choose from. One of the inspiring celebs is Rihanna and in this picture she is rocking a short pixie hairstyle with two colors that is black and brown. The sides are shorter as compared to the top so you can play with it in any way. There is something about these dreadlocks that lets you get away with just about any look. Once you properly get your hair locked, you won’t only save a lot of money have to constantly visit the saloon, but you can just play with the look and create an Up-do like the one in the image above. To get that look, you can just pick three straight lines of locks and then start braiding them together all the way till the while head is done. After twist those braids together and secure them. Now there are two kinds of teenagers; the ones that strive to look older and the ones that enjoy their sweet adolescent age. I don’t know which one you are but I have the best hairstyle for you. It’s that medium length curly hairstyle which is not too mature -ish and neither it is childish. It’s just perfect! Such a hairstyle will satisfy your zeal by making you stand out of the crowd with an edgy presence and yet it’s so easy to pull off. A side braided hairstyle will switch your looks in seconds…believe me! What I love most about this hairstyle is that is an ultimate cure from the lifeless mop of long hair or even any medium long hair that keeps on mopping on the facial features. All you have to do like she did is braid the hairs from one side to the other after you have figured out from which side you want it to go to. Use the different techniques of braiding to make your side braided hairstyle even more unique. If you are experiencing hair thinning due to different reasons like age, medication and so much more then its better you don’t go for hairstyles that require a lot of hot tools or even braiding that requires a lot of hair pulling because these will only worsen the condition. 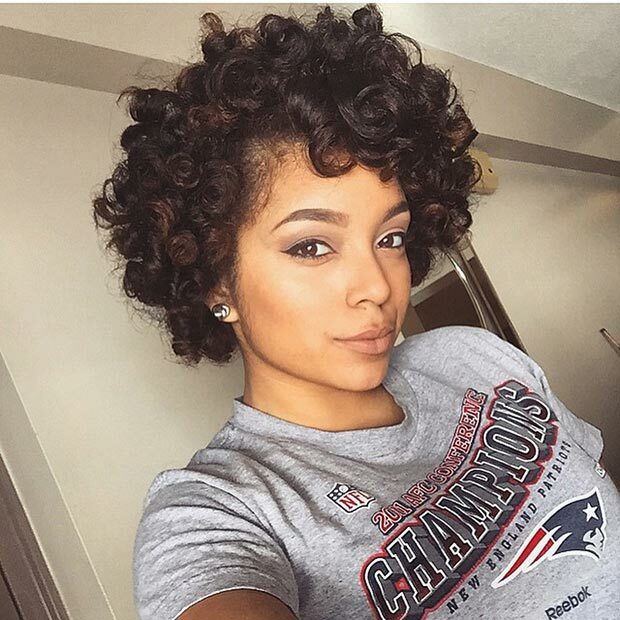 Rather go in for something simple like in the image above that is just short naturally curly hair. 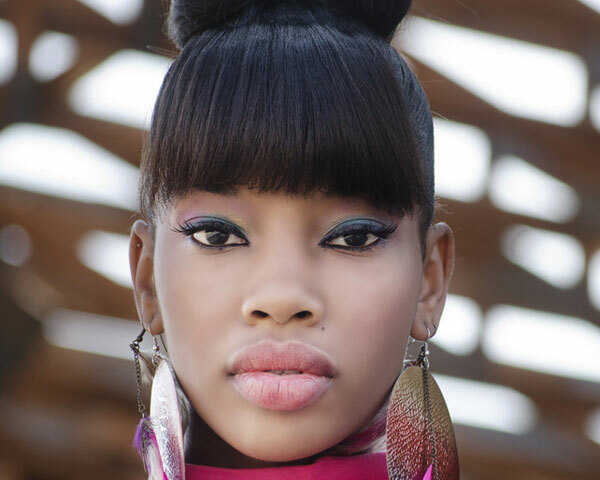 This hairstyle is great for all age groups and can easily be styled through applying some good quality oils. 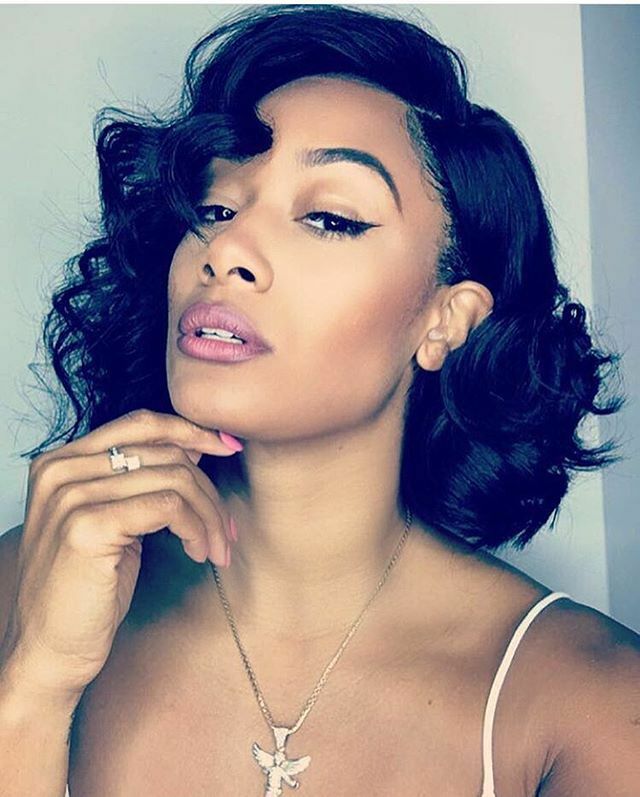 A curly bob hairstyle is the simplest way to enjoy the best of both worlds. 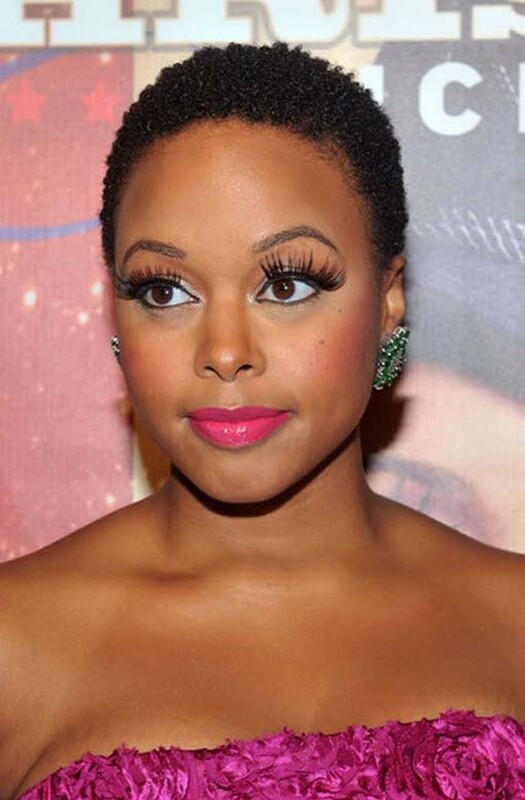 This will create a very appealing look that can take you places…work…date night….red carpet…weddings and so forth. This lady placed in hair big curls especially towards the edged creating an impression of huge curls and drawing attention to the long neck. Never at any point underestimate the power of a face-framing full bang or fringe like the one pictured above. After all its one of the best ways you can do justice to yourself by fully complimenting your hair. This full bang will have you draw attention to only where you want like the eyes going downwards. Make sure you get the right length for the bang.